Indian culture is embedded with rich culture and heritage and is deeply rooted in Traditions, Indian Clothing is known for its elegance and ethnicity all over the world. Saree fashion highlights the beauty of women in the most graceful and natural manner. A saree, sari or shari is a female garment from the Indian subcontinent that consists of a drape varying from five to nine yards that is typically wrapped around the waist, with one end draped over the shoulder, baring the midriff. Saree is always a preferable wear for women. Here we are suggesting Top 7 Saree Picks For Summer as anything you wear or drape not only reflects your style but your taste too depending on the season, weather and occasion. 1. 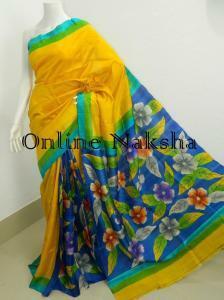 This floral painting acid painted pure silk saree looks very beautiful and bright due to its color combination. The saree is both trendy and fashionable. The saree lovers will be promptly attracted by this Fresh Floral saree. It carries a soft texture and light weight therefore it will be ideal to provide comfort in this hot sunny days. Women who prefer trendy or floral painting most, it will be a perfect pick for them. 2. This Mulberry will be another awesome pick for the summer. This Royal blue saree with multicolored checked pallu and pleats with surely maintain your style, keep you in trend and comfort altogether. The saree comes with a soft flawless texture with natural Silk shine. Its a Silk Marked product perfectly made for a head turner look. 3. To flow with both modernity and fashion Mayurkanthi Mulberry Sarees are undoubtedly adorable. The saree has an eye catching beauty for its 3D look. It weaved with combining four colors threads. It is soft textured and light in weight and best for those who wants to maintain a high profile look with comfort, thus it is both comfortable and fashionable at the same time. 4. Many of us prefer comfortable cotton drape for summer so that we can move wherever we wish spontaneously. We become worried about the hot sunny days and try to maintain our clothing in such a way that we can keep balance between our clothing and comfort. This off white cotton saree is ideal drape for summer as light colors absorbs less heat. 5. If you like simple one color or half half sarees you can surely go with this Half Half Sonamukhi Pure Silk by Online Naksha. This saree is very soft in texture and light in weight. The unmatched color combination of this saree has made it unique. The natural shine it bears is adorable. This saree will look trendy while teamed up with any printed blouse. 6. Mercerized Ghicha sarees are now in fashion and one of the trendy choices of today’s urban women. The featured Ghicha Silk Saree has a flawless texture with Dyed Ghicha Pallu. The Soberness and color combination of the saree is adorable. Its suitable as a day wear or office wear. 7. To make yourself totally different from others and keep yourself in comfort you must select this soft cotton drape. Its woven of pure cotton and the texture it carries is very much soft. Add this to your wardrobe to experience how simple sarees can make you trendy besides being comfortable.